On June 27th family and friends gathered in Greer to honor the memory of Rev. Henry Wright, former Chaplain of our Association, who passed away on Sunday, June 14th. Henry Wright was born May 13, 1927, in the small Town of Alligator, North Carolina. During late childhood, Henry had to go to work in order to help his mother support their family because of his father’s poor health. Near the end of WWII, Henry joined the Navy and served on the Destroyer, U.S.S. Kenneth D. Bailey. After being discharged from the Navy, Henry was called to enter the ministry, and to prepare himself for God’s work, he entered the South Eastern College of the Assemblies of God in Lakeland, Florida. Life was not easy then for Henry, and he partially supported himself by busing tables at the Blue Plate Diner. While in Bible College, he met the love of his life, Anne Chambers Perry, and they were married in August of 1949. In the years following their marriage, Henry and Anne served churches throughout North Carolina and eventually moved to Greer, South Carolina, where he served as Pastor for 35 years. Henry is survived by his children: Lloyd, Carol, and Beth; two grandsons, William and Isaac Swett; a brother, Frank; sisters, Elizabeth and Rose; and sons-in-law, Jeff and Guy. Henry Wright was a “Jack of All Trades.” He learned the skills of roofing, plumbing, carpentry, HVAC and sheet metal fabrication from his father-in-law. His skills served him well while in Greer when he and a number of deacons built a home missions church in Taylors. Henry also helped build the Assembly Acres, a retreat and summer camp for the Assemblies of God churches in South Carolina. While in Greer, Rev. 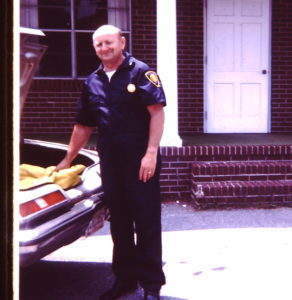 Wright began working with the local police and fire departments as their Chaplain. In 1967, former Greer Chief and Association President, R. B. Colvin, urged Henry to apply for the position of Association Chaplain. The Executive Committee at that time (B. R. Huckaby of Parker District, J. G. Mishoe of St. Andrews, Hans Walker of Croft, and S. E. Hendrick of Conway) unanimously agreed that Henry Wright was the man for the job. For the next 19 years, Henry Wright served this Association faithfully at meetings, the annual Conference, funerals and other events. 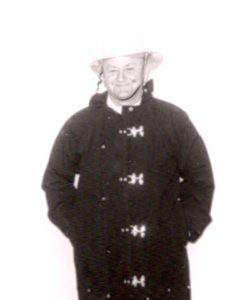 During the time of Henry service to this Association, the fire service was going through many growing pains. Arguments abounded…it almost seemed like there was a boundary line between the fire departments above Columbia and those below the Capital City. Change was in the air, and many of our leaders in that day did not play well together. But, Chaplain Wright often came to the table to calm the waters with his gentle spirit and Christian admonition to bring order to passionate views of just how best to approach change and growth. While I served as President back in those days, I recall very clearly having many “side bars” with the Chaplain about leadership and how to handle conflicting opinions and approaches to issues. I loved his prayers and appreciated his listening ear. A gentle man…a true servant of God! I acknowledge the fact that few in the fire service today remember Chaplain Wright or even know his name because several generations of firefighters have now come and gone. But, we know for sure that Henry Wright’s name is recorded in this Association’s history book as one who contributed in his time and his own way to the progress made over the years. So, I conclude this tribute by saying this Association is grateful to God for sending Rev. Henry Wright to us….for his help and his many expressions of love towards us. We, too, are grateful for the time we had together. It seems appropriate that we should always remember and follow the fine examples of love and brotherhood Henry William Wright set for us in South Carolina. One can only imagine the turmoil and opposing views he was destined and determined to bring together in any sense of the word -unity. I extend my admiration and respect for his efforts and countless hours of service.